What did a Templar wear on his head when going into battle? 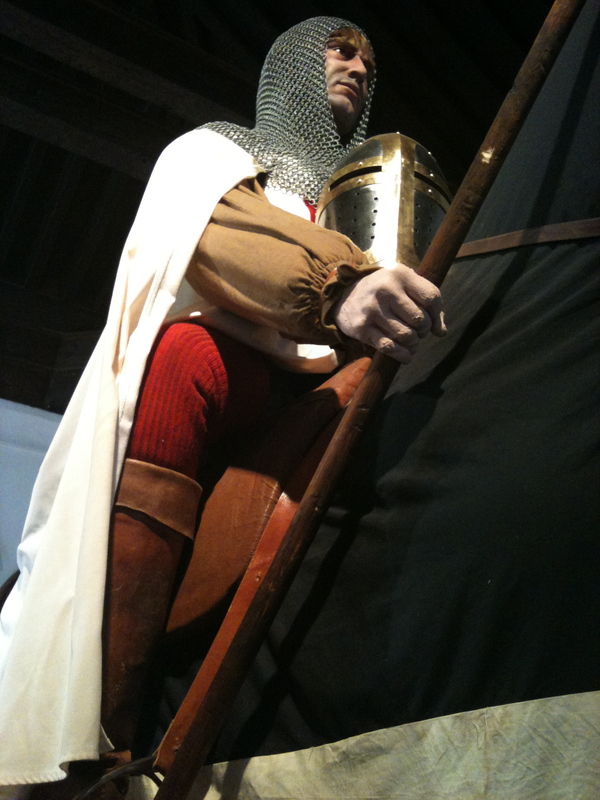 The fact is that the helmet worn by the knights changed over the centuries starting as something more Norman in character and ending up with the big sugar-loaf shaped helmets enclosing the head entirely. What can we see in this photo? Starting with the headgear then. He is holding what seems to be a so-called ‘sugarloaf’ medieval helmet. A wrap around helmet protecting the entire head but with no visor. This places it in the 1200s. Prior to this, there would have been a more open helmet with a nose guard or triangular piece of metal protecting the face but leaving the sides of the head more exposed. Covering his head is a ‘coif’ of chain mail. This is like a metal balaclava that can be removed. Again, this puts it slightly later in Templar history in the 1200s. In the previous century, the head covering was part of one long piece of chain mail covering the head and trunk of the body and stretching down to the knees and was called a ‘hauberk’. Later in the 1300s, we see ‘aventails’ depicted a lot more – these were a flap of chain mail attached to the helmet rim that extended across the chin and covered the neck, leaving just the face exposed. ← Most gory Catholic churches in the world!